Saturday, March 9th at 6:00 pm. Hooray! 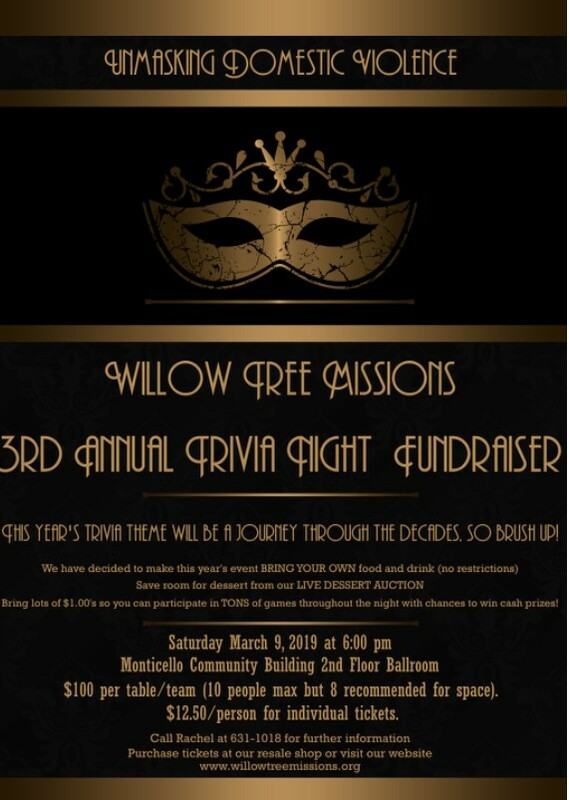 It is time for our 3rd Annual Trivia Night Fundraiser! We had a great turnout last year and cannot wait to see you all again! This is a family-friendly event. It's great for a couples night out or for your whole family. 10 fast-paced rounds of trivia - no cell phones, please! This year's trivia theme is "A journey through the decades." We will NOT be serving food at this event. Teams are allowed to bring in their own food/snacks/drinks. No restrictions. Remember to save room for dessert from our live dessert auction. Your participation in this event will help directly fund our domestic violence program for Piatt County. Willow Tree currently provides victims and families of domestic violence with help in the form of legal advocacy, prevention services, education services, escape and safety planning, Neighbor House Home for Women and Children (short and long-term shelter), crisis counseling, and a 24-hour crisis hotline.